The Mark 82 (Mk 82) is an unguided, low-drag general-purpose bomb, part of the United States Mark 80 series. The explosive filling is usually tritonal, though other compositions have sometimes been used. With a nominal weight of 500 lb (227 kg), it is the one of the smallest in current service, and one of the most common air-dropped weapons in the world. Although the Mk 82's nominal weight is 500 lb (227 kg), its actual weight varies considerably depending on its configuration, from 510 lb (232 kg) to 570 lb (259 kg). It is a streamlined steel casing containing 192 lb (89 kg) of Tritonal high explosive. The Mk 82 is offered with a variety of fin kits, fuzes, and retarders for different purposes. 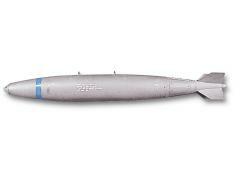 The Mk 82 is the warhead for the GBU-12 laser-guided bombs and for the GBU-38 JDAM. Currently only the General Dynamics plant in Garland, Texas is Department Of Defense-certified to manufacture bombs for the US Armed Forces. The Mk 82 is currently undergoing a minor redesign to allow it to meet the insensitive munitions requirements set by Congress. Mk. 82 bomb with Tail Retarding Device – this photograph shows an unfuzed, museum display Mk 82 with its usual combat paint scheme. For display purposes, the optional high-drag "Snakeye" tailfins used for low-altitude release are shown. According to a test report conducted by the United States Navy's Weapon System Explosives Safety Review Board (WSESRB) established in the wake of the 1967 USS Forrestal fire, the cooking off time for a Mk 82 is approximately 2 minutes 30 seconds. More than 4,500 GBU-12/Mk 82 laser-guided bombs were dropped on Iraq during the Persian Gulf War. France requested 1,200 MK82s in 2010 to Société des Ateliers Mécaniques de Pont-sur-Sambre (SAMP) which builds MK82s under licence. Saudi Arabia requested 8,000 Mk82s in 2015, along with guidance kits and other weapons.